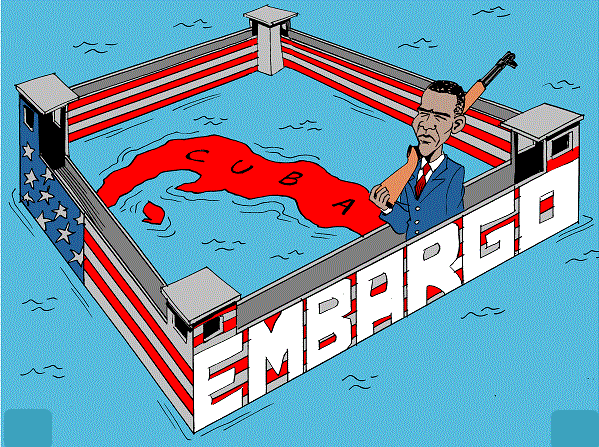 The embargo on Cuba was put in place at a time when the world was starkly divided between allies and enemies. It was never about the country being run by a dictator. Four months after leading a successful revolution in Cuba in 1959, Castro came to the United States on an 11-day visit at the invitation of the American Society of Newspaper Editors. Mr. Castro placed a wreath on George Washington’s grave, toured the Bronx Zoo and ate hot dogs and hamburgers at Yankee Stadium. For the most part, the visit went well until his speech at the Council on Foreign Relations in New York where Mr. Castro underlined that he would not beg the United States for economic assistance. That didn’t sit well with the US government; US-Cuba relation had deteriorated rapidly from that point onward. Two years following Mr. Castro’s visit to the United States, the US government put in motion a plan (Bay of Pigs operation) to oust Castro. Notice that up to this point Mr. Castro did nothing wrong to the United States government or the American people; he merely stated his position in regards to economic assistance for his country which incidentally he had every right to do. As it is with everything Washington does in the name of the American People, there was no justification to go after Mr. Castro. Needless to point out that the operation – to oust Mr. Castro – was a disaster, thus increasing the political tensions between the two countries. As it is expected in any rancor, both sides employ and use tactics to hurt the opponent. So it went with Cuba nationalizing close to one billion dollar in US Assets, and US placing an embargo on Cuba. That is in essence the issue at the heart of US-Cuba unfriendly relations. But the US government has duped the American people for well over 50 years, accused Castro of sponsoring terrorism and violating human rights. The propaganda – with the complicity of the US media of course – has been so ingrained in the American consciousness that even past presidents (latest was Bill Clinton in 1999) had tightened sanctions against the impoverished island based on “US must have his way in Cuba at all cost”. Shamefully, the body of government which represents the American people (Houses of Representatives in Washington) went along and passed several Acts to tighten, to keep in place the embargo and to continue to isolate the island. Ironically, despite the economic pressure, Mr. Castro has continued to run Cuba as best as any leader could under such condition. As it stands today, Cuba has more doctors than any country in the world and is always the first country to send medical assistance to any part of the world where disasters (natural and man-made) strike. There is even a FREE medical school program offered in the island to anyone who has no objection living in Cuba (all expenses paid by the Cuban government) for the duration of the studies (5 to 6 years). The embargo had served only two purposes, both of which are despicable, to establish that US government has no qualm “crushing” countries that do not go along with what it wants and punishing the people of Cuba. So, it is embarrassing to hear any argument, especially from Marco Rubio (US Senator of Florida), against the lifting of the embargo. Insanity, they say, is doing the same thing over and over and over and expecting a different outcome. After 50 years, it should have been obvious to the smart gals/guys in Washington that 1) the embargo does not and cannot work 2) the US government was wrong to place the embargo in the first place. The American people, the nation as a whole should praise President Obama to have broken the cycle of insanity deeply ingrained in Washington in regards to Cuba. The lifting of the embargo is not checkmate for Mr. Obama or a victory for Mr. Castro, it is a relief for the people of Cuba, the primary victims of the embargo; that should be welcome news to everyone, especially Senator Marco Rubio whose roots originate from the island. Well done, Mr. Obama! Well done! American Pride or Global Accolade?